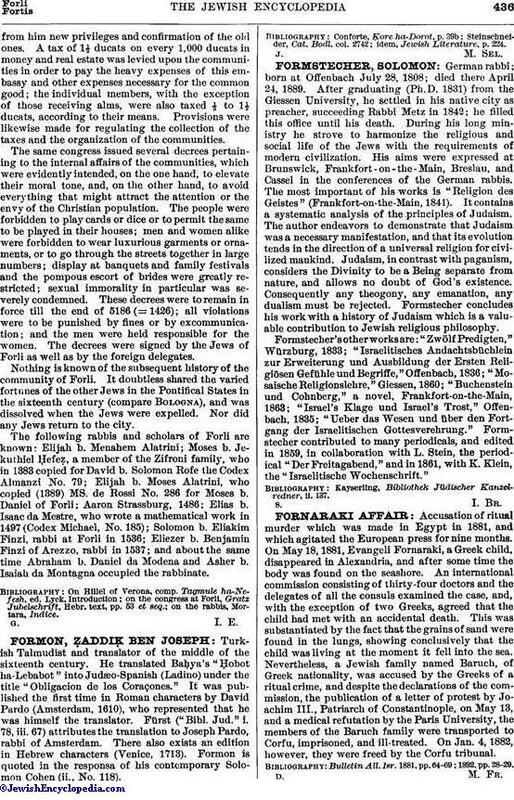 Accusation of ritual murder which was made in Egypt in 1881, and which agitated the European press for nine months. On May 18, 1881, Evangeli Fornaraki, a Greek child, disappeared in Alexandria, and after some time the body was found on the seashore. An international commission consisting of thirty-four doctors and the delegates of all the consuls examined the case, and, with the exception of two Greeks, agreed that the child had met with an accidental death. This was substantiated by the fact that the grains of sand were found in the lungs, showing conclusively that the child was living at the moment it fell into the sea. Nevertheless, a Jewish family named Baruch, of Greek nationality, was accused by the Greeks of a ritual crime, and despite the declarations of the commission, the publication of a letter of protest by Joachim III., Patriarch of Constantinople, on May 13, and a medical refutation by the Paris University, the members of the Baruch family were transported to Corfu, imprisoned, and ill-treated. On Jan. 4, 1882, however, they were freed by the Corfu tribunal. Bulletin All. Isr. 1881, pp. 64-69; 1892, pp. 28-29.